During my recent trip to the APPT Event in Sydney I got to rub shoulders with some of the bigger names in Poker. My time with Greg Raymer was a definite highlight. Spending an hour with one of the genuine nice guys in poker was an amazing experience and something that I am extremely grateful for. I requested ten minutes of Greg's time and we chatted for over an hour. I didn't meet Greg the poker player, I met Greg the man. UKPN: Thanks for taking some time out to talk to me on behalf of UK PokerNews. Greg: No problem at all. So you're an Australian working for UK PokerNews? That's a bit different. UKPN: Definitely. It's a lot of fun and I hope to have the opportunity to travel there early next year. Greg: You will have a lot of fun. There is a lot to see and do over there. UKPN: You burst onto the scene when you won the WSOP. How has your game improved since then? Greg: Not as much as I wish. I am still along way from the best players in the world and I am always working on improving my game. I feel like I'm not 100% all of the time and it is definitely something that I want to achieve. I try and play every single hand to the optimum levels of my game. UKPN: Do you think you will continue playing poker at the same rate for the next few years? Greg: I travel on the road for 2/3rds of the year and that is tiring. But I'm not like the other pros. I don't play anywhere near as much as a lot of the other guys. They get to an event and play all the lead-ups and then the Main event. Then they are looking for the next festival. They play cards nearly every day of the year and have a quick break at Christmas and New Years because they pretty much have to. I am different though. I will get to a festival and take my time and look around the city. I normally focus on playing the Main Events and take a break during the preliminary tournaments. So I guess I play around 40 events every year. It's funny because I actually used to play more when I was a lawyer. I used to play every Tuesday at Foxwoods. So I don't think that burnout is a problem at all. If anything I could play more to stay sharp. UKPN: How much time do you spend playing online? Greg: I spend 15 hours a week playing cash games at PokerStars. 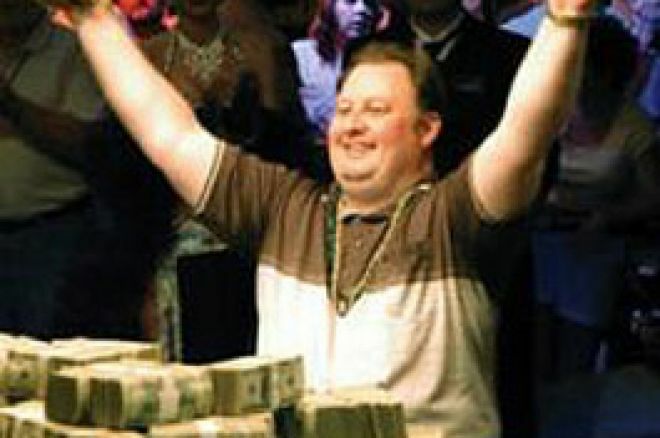 UKPN: What does Greg Raymer love to do away from the Poker table? Greg: While at home I love to spend time with my family and friends. Whilst I'm on the road I love playing golf. I am currently off a handicap of 16 which I am always looking at improving. UKPN: What makes Greg Raymer mad? Greg: I have a good sense of humour and it's hard to make me mad. If I play poorly I get disappointed and if people make foolish mistakes away from poker I get annoyed. But to make me mad you need to try and hurt me. If you are mean to me it will hurt me and make me angry. But other than that I'm a friendly guy. Greg: I would have to say the Lord of the Rings Trilogy. I thought the story and affects were amazing. Greg: My first answer is one that will definitely be unique. I love the English show Bargain Hunt. One of my hobbies is shopping at markets, so I find the show extremely interesting. My second answer is the more obvious one. I love South Park, Family Guy and The Simpsons. I like South Park because it doesn't just push boundaries; it acts like there are no boundaries. The Simpsons and Family Guy are both extremely funny. UKPN: You have to love Stewie Griffin. Greg: Stewart is great. What a funny character! UKPN: Do you have a goal for poker over the next ten years? Greg: No. I don't believe in setting goals. I think it's a big mistake. My one goal I guess you could say is to play each hand perfectly. Specific goals lead to danger. UKPN: I'll leave this question in your hands. Daniel Negreanu? Greg: I was amazed that Bluff Magazine has us listed as one of their top ten feuds in poker. We exchange views, but to say we are feuding isn't correct. He and I are simply two people who speak our minds publicly and happen to disagree on some issues. UKPN: Chris Moneymaker and you were two of the nice guys that won a WSOP Main Event and really helped create the global poker boom. Normal everyday people felt like they had a real chance at winning the event. Jamie Gold has seemed less popular. Any comment? Greg: I've only met Jamie twice and I give no credence to what is shown on television. So I have got no real opinion at this stage. UKPN: The Aussie Millions are in January. Do you intend on staying here and seeing some of Australia? Or heading home? Greg: I will fly home and spend some time with family and friends. I'm not 100% sure about the Aussie Millions at this stage because I have the flagship PokerStars Event in the Caribbean. I will play the Charity Event in Sydney and then fly home. UKPN: What is the charity you are representing? Greg: I am playing for the Bubel-Aiken foundation. My wife is involved in the Charity and it is something that is very important for both of us. I really hope I can win the event. The Charity is a great one that helps kids in a special way. Have a look at the web site. It is extremely interesting and worthwhile. UKPN: I will do that. You have played a lot of poker throughout the UK. Can you please tell our readers how you found that? Greg: I enjoy London as a city. It is extremely expensive as a city to live in, but I love visiting. The United States and Australia don't have the history that England has. I love antiques and ancient history, which I can find in the UK. I find visiting those places nicer and more interesting than the US. Dublin was also a very interesting place. As for poker, I have played the EPT London, WSOPE, EPT Dublin, British Poker Open and other events. I have also come to London several times to record commentary for various episodes of the EPT television shows, which is good fun. UKPN: One last question. Do you have any advice for the readers at UK PokerNews? Greg: The most important thing is to play within your bankroll. Poker is a wonderful game, but people losing money that they can't afford to is the one negative of the game. If you can manage your bankroll and play solid poker you will get something out of the game. UKPN: Thanks for your time Greg. Good Luck for the Charity Event and taking it home for the Bubel-Aiken Foundation. Hopefully we can catch up in Melbourne if you get to the Aussie Millions. Greg: Thanks for that and no problem at all. Ed note: Have you tried the juicy cash games at Everest Poker yet? Stocking Fillers for Poker Players! Who Would Be Your Least Favourite Celebrity Poker Opponent?